Francisco de Zurbarán was a Spanish artist of the 17th Century who devoted himself, mainly, to the portrait of religious motifs and still lifes. Although his style is more rigid and less experimental, his use of the technique of chiaroscuro made him to be nicknamed as “the Spanish Caravaggio”. 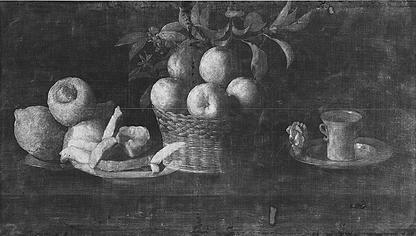 His work Still life with lemons, oranges and a rose represents his maximum achievement in this kind of painting. This is, even, the only still life he signed in his life, at the lower right corner. In the painting, we can see a plate with citrons (yes, despite the name, the fruits are not lemons but citrons, much larger), a basket of oranges and another plate with a cup, next to a rose. The craftsmanship of the artist, who portraits these objects in a hyper realistic way, can be noticed in the reflection of the citrons on the silver plate, in the details of the wicker basket, in the soft reflection of this basket on the table and in the amount of textures beautifully executed in the composition. Also, the play of light and shadows is amazingly subtle but profound. The color of the fruits, although dull, pop-up and contrast against the black background and the dark tone of the wood from the table. All this, clearly shows us the deep knowledge of the artist on the oil technique. The motif was traditionally interpreted as homage to the Virgin Mary. It seems that the citrons refer to fidelity, the basked with oranges represents virginity and, at the end, the rose would symbolize divine love. Also, the composition, divided in 3 parts, would represent the Holy Trinity. 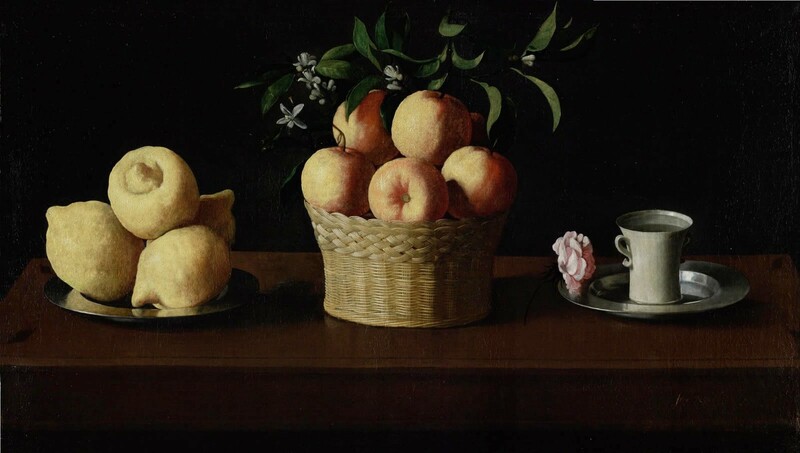 However, there is no source that can confirm that this was Zurbarán’s intention, more so, the x-ray performed to the canvas proved that the artist also painted a plate of caramelized sweet potatoes, a treat in that time. So, the religious interpretation of the work is, definitely, insane; and the intention of the artist was, simply, just to portrait something beautiful. And nothing else. ~ by Álvaro Mazzino on April 13, 2011.
or a tribute to solitude. and stand between us and nothing. It’s most likely easier to resell, too. Now the reissue 2.55 has great resell value as well, but it’s probably a little bit harder to sell as more people recognize the classic flap more. According to the Center on Budget and Policy Priorities, a 21-year-old man on poverty-level wages ($12,500 a year) must pay $956 in payroll taxes, plus $214 in federal income taxes. This entry was posted on April 13, 2011 at 09:32 and is filed under Baroque.You can follow any responses to this entry through the RSS 2.0 feed.You can leave a response, or trackback from your own site.